Refrigerated wine cellars must be carefully designed and constructed in order to achieve and maintain the optimum conditions for storing and aging wines. Installing a wine cellar refrigeration system without preparing the room properly will not only cause damage to the cooling unit itself, but also to the walls, ceiling, and a large part of the wine collection. Proper room preparation is a fundamental component of wine cellar construction, as it will help create the best possible wine storage environment by controlling environmental elements that could otherwise negatively impact the overall quality of the wines. Well-constructed wine rooms are properly insulated and sealed, to maintain the ideal climate conditions for storing wines over a prolonged period of time. 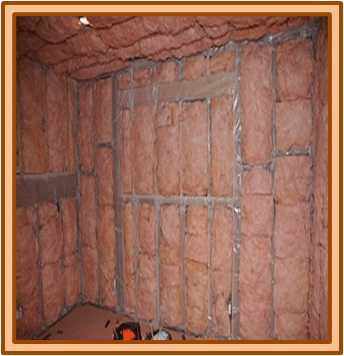 Wine cellar insulation must be applied to the walls and ceiling, using polystyrene (rigid foam), blown-in insulation, or fiberglass. A minimum rating of R-32 is recommended for the ceiling, and a minimum of R-22 for interior wall surfaces. Applying wine cellar insulation with sufficient R-value provides better cooling. The absence (or lack of) proper wine cellar insulation may cause temperature fluctuations that can lead to the ultimate breakdown of the cooling system, as the unit tries to compensate for the excess heat. What are Vapor Barriers and How Can They Help? Vapor barriers are essential to wine cellar construction, because they help regulate humidity inside a wine storage space. To ensure a proper and complete vapor barrier, apply it to the warm side of the walls, ceiling and flooring. Six millimeter or eight millimeter plastic sheeting is recommended, in order to prevent moisture migration. Why is it Important to Choose the Right Wine Cellar Door? The right type of wine cellar door will provide a complete seal in a wine storage space. 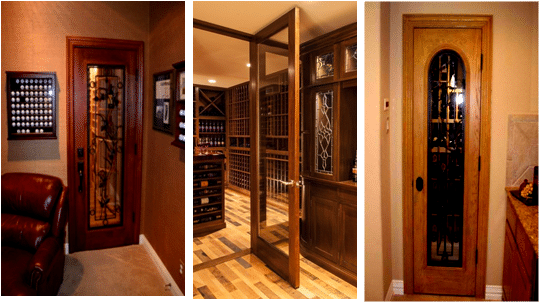 An efficient wine cellar door is constructed from laminated veneer lumber (LVL), which prevents the entry door from warping and provides insulation. A wine cellar door must be weather-stripped on all four sides, and equipped with an automatic door bottom that seals the gap at the bottom, ensuring a tight seal in the wine room. All crucial components of wine cellar construction must be addressed before wine cellar cooling installation takes place. Addressing these factors first hand will help determine the proper climate control system for a wine storage room. An HVAC cooling unit must be integrated into the design and construction of a wine cellar, to ensure that it suits the cooling needs of the storage space. Wine cellar climate control systems are essential to creating a constant and stable wine storage environment. There are three types of wine cellar HVAC cooling systems to choose from: self-contained cooling units, ductless split refrigeration systems, and ducted split climate control systems. A self-contained cooling unit fits between wall studs and vents through the wall. It is the easiest to install, and the most affordable climate control system. This refrigeration unit requires venting into a large, well-ventilated, adjacent room. Possible rooms that can accommodate the heat and noise generated by the cooling unit are mechanical rooms, basements, or even a garage. Ductless split refrigeration systems consist of an evaporator unit and condensing unit. Splitting them allows for multiple installation options, as well as efficient and quiet operation. A ductless split system uses a line set to connect the evaporator (usually placed inside or near the wine room) to the condenser (installed outdoors). A line set is composed of electrical wiring and copper tubing. A ducted split climate control system has the advantages and benefits of a ductless split refrigeration system. The only difference is that the evaporator can be placed in a different location, thus allowing for the maximum capacity of storage space, and adding to the aesthetic nature of the room. Both ducted and ductless split systems need to be installed by a professional HVAC heating and cooling specialist. An HVAC heating and cooling technician ensures that the units are properly installed, and that they always function at their optimum levels, as damages and breakdowns are bound to arise down the line. There are several factors that must be taken into account prior to wine cellar cooling installation. These factors are wine room size and location, ambient climate, intended use, frequency of door opening and closing, the quantity of wine bottles, etc. It is always recommended to consult a professional, to ensure that the wine cellar cooling installation is done properly, and that the specific cooling unit suits the needs of a wine room. Wine cellar designers and builders perform a heat load calculation that will help decide on the proper climate control system that will efficiently cool a wine storage space. 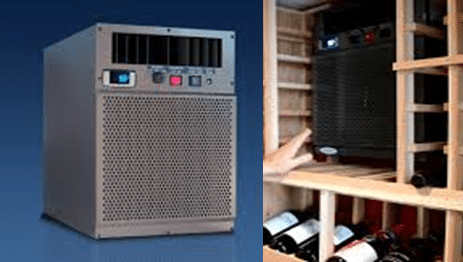 They provide clients with specific options regarding the type of HVAC cooling unit, along with the different models that will best address the cooling needs and requirements of a given wine cellar. 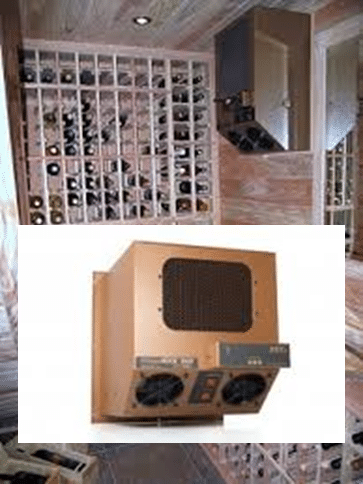 Most wine cellar builders carry a wide selection of wine cellar climate control systems, from some of the leading manufacturers of HVAC heating and cooling systems in the country. They offer a range of cooling units for various applications, from small wine cabinets to large custom wine cellars. Custom Wine Cellar Cooling Los Angeles is one of the best wine cellar cooling systems provider and wine cellar cooling installation experts. 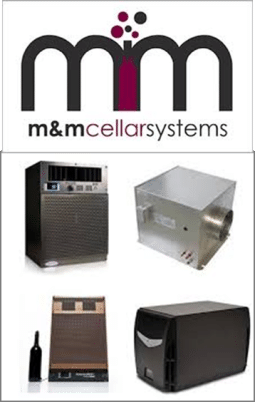 Our line of wine cellar cooling units are of high quality and efficiency. We offer and install wine cellar cooling systems from US Cellar Systems, CellarPro, WhisperKOOL, and Wine Guardian. These four manufacturers have been trusted for years by wine cellar companies. Wine Cellar Cooling Los Angeles is a fully licensed company that caters both residential and commercial wine cellar owners who need a wine cellar construction specialist and wine cellar cooling installer. For inquiries about our wine cellar cooling products and services, contact us at +1 (323) 578-3330.